Sony Bravia KDL-42W650A review - today at our consumer blog we are going to take a look at one of the latest 42-inch Sony Full HD TVs which offers great picture quality and will suit best everyone who needs an excellent home cinema experience without 3D effects. 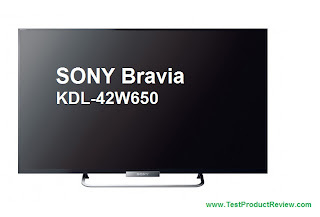 Sony Bravia KDL-42W650 is still not very popular around the world and the reason for that is not the lack of quality or functions which this TV is fully packed with but because of the fact that the KDL-42W650/ KDL-42W650A is mostly going to be sold in Eastern Europe and some parts of Asia. Of course you can find this TV in other countries as well but it is still not presented in huge markets like UK and USA. Now lets talk about the TV itself and I am going to start with the look and feel of the TV. As most of the recent Sony TVs the Bravia KDL-42W650A is an exceptionally good looking piece of technology. It is entirely made of quality materials like hard plastics and some metal finish here and there and if I had to be honest it really looks great. The panel itself is quite thin and the frame of the TV is pretty small so the KDL-42W650 looks quite compact for a 42-inch TV. Sony Bravia KDL-42W650 is fully packed with features and probably the only thing that I can see missing is the 3D which I personally don't need for my home TV. Currently I use the Sony KDL-32EX650 which doesn't have 3D and I don't think I will be upgrading my TV soon just because the lack of this feature. One thing that I particularly like in new Bravia TVs is the Smart functions they offer. They look a bit complicated at first but once you get to know them just a bit better you see they are quite intuitive and easy to use. And this is the part where the Sony Bravia KDL-42W650 really shines. It offers hustle free Smart TV experience with plenty of new and upgraded apps for this new series Bravia TVs. I myself mostly use the YouTube application on my Smart TV but there are are plenty of other apps that you may find interesting. One thing I like very much in Bravia Smart TVs is the quality hardware which Sony is using - the fast built-in WiFi N connection works flawlessly with most wireless routers. And there is surprise for this new Bravia TV, it is now 3G enabled through a 3G dongle so now you have another option for connecting to the Internet. Another big improvement in the KDL-42W650 over the previous models of this size is the sound quality this TV delivers. The two 8W high quality surround speakers with bass reflex system deliver great sound experience. Of course if you are into buying this TV I would recommend you to invest a bit more for a nice more powerful external sound system, there are plenty of these in tech stores and their prices are also pretty good. The picture quality of the Sony Bravia KDL-42W650A is very good and so are most of the specs of this TV. The only thing that worries me is the fact that some Sony LED TVs tend to experience some minor LED backlight bleeding effects which is actually something pretty common even for expensive LED TVs which are not using special technology to reduce this effect to an absolute minimum. Everything else in the Sony Bravia KDL-42W650A is perfectly OK and it is one of those TVs that is definitely worth the money and you are definitely going to enjoy. It is still considered to be a new model in the Bravia series so its price is still pretty high (around 650 Euro) but I am sure big resellers are going to have it on sale very soon. Now there is a newer slightly updated version of this TV - Sony KDL-42W651. There is also a smaller (and of course cheaper) version of the KDL-42W650 - the KDL-42W650. 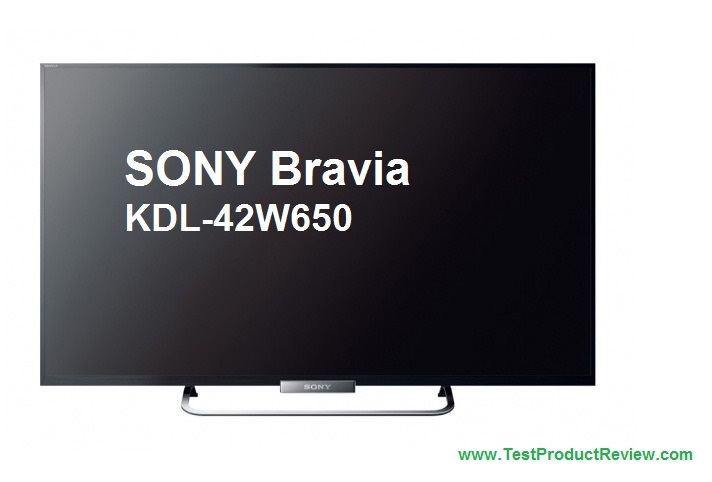 You can find out more about it at the Sony Bravia KDL-32W650 review. And in 2016 Sony launched the X850D series which again is an amazing success and impresses with quality 4k picture and a nice set of smart features through Android. Thanks for checking my Sony KDL-42W650A TV review, I hope you found the information useful. Please let me know what are your thoughts about it, I will be happy to hear your opinion. Its a defective TV, the picture is not clear even if you use a setup box, the TV doesn't support most of the formats, the external devise gets hanged, I has a video 2 defective.Samsung by far is the best as it last for long. I am sorry to hear that. Did you contact Sony support. I am sure that is not the case with all Sony Bravia KDL-42W650 TV s as I myself am using Bravia Smart TV for almost a year now and I didn't face any problems with it so far. You probably got your KDL-42W650 with 2-year warranty so I am confident they will fix it for you free of charge. Just brought the TV couple of days back. Transcend(8 GB) and HP(16) pendrive seems to have a compatability issues. I have tried formatting the pendrive in FAT32, exFAT as well as NTFS file systems, but TV just hungs-up after few seconds when I browse through the media file to be played in the TV itself. I also have a WD(1 TB) harddrive formatted in NTFS, but this plays without any problem. Is there any solution to this? Waiting for a quick reply. I am planning to buy this TV. My only query is, whether the TV has built-in Wi-Fi Adapter ?? or I need to buy the Sony UWA-BR100 Adapter to connect to Wi-Fi ?? Are there any compatibility issues because the page for UWA-BR100 says that it doesn't support KDL-42W650A TV !! please reply asap. Yes, both Sony Bravia KDL-42W650 and Sony Bravia KDL-42W650A have WiFi built-in, I think it is very clearly said in the article - you have WiFi N connectivity for connecting to the Internet and other WiFi compatible devices. Good luck with you new TV, this one is a great choice. One thing about this Tv that was a bad surprise is the lack of RGB (PC) connection, this because even the more basic-cheap LCD have this type of connection. I wondering if is possible connect my laptop or netbook (that doesn’t have HDMI) with a converter RGB (VGA) to component or some alike with the same quality as RGB to RGB. ¿Anybody knows if is possible? Hi, I want to buy this tv. I want to know that the sound quality is really good? specially clear voice(talking) ? Don't worry Safal, the Sony KDL-42W650 offers very good sound quality but as we mentioned above it will be even better with external sound system. The model KDL-42W650A that my family buy, dont have PC in (or d-sub), just normal audio-video, component, HDMI and other input thing called mirror i think. You might be right, unfortunately Sony skipped the D-Sub option for the KDL-42W650/ KDL-42W650A which is a real shame. I am constantly using this port on my older KDL-32EX650. Shame on you Sony. is it give effect or virus if i connect with pendrive?? What is the major difference between these two and which one is better? There are no major differences between the Sony KDL-42W650 and Sony KDL-42W650A. Yesterday i took a demo of this TV, colour quality is good, but its too bright. Sound is damn good. The biggest prob is you need to use wifi dongle, since its not built in wifi (at least in India). Comparative to previous Bravia this remote and menu options are improved but still you need to get hang of it. Cost is 65K, pretty high compared to its competitors. the picture is not clear even if you use a setup box, the TV doesn't support most of the formats. Wanted to buy this TV in this weekend. Just wanted to confirm if the TV is having compatibility issues with pen drive and supporting different video formats(eg, mov or MKV or flv or aac). Is it NTFS or FAT32? Im planning to buy this tv, just wondering if i can plug a external HD via the usb port and also, does it support mkv files? It depends on the hard drive - FAT32 or NTFS. NTFS hard drive probably won't run. As for the MKV files - yes, the Sony KDL-42W650A supports MKV file playback. Can I watch internet TV (ITV) on it? Yes, this TV has iTV, myTV, Smart TV, HDTV... all kinds of TV. Does it support flash player? Can i watch movies direct from browser? The browser isn't any good, but there are plenty of good apps for watching video - I use the YouTube app all the time, HD videos come out really nice. Hi Admin team, I bought my Wk650 model and unable to connect my Tata photon data card for internet connection. Why is it so ? Error message : Insert compatible device. And tried to Connect Via WIFI , it is also not connected. Advice What needs to done ? Do I need to use any specific Data card ? or any other device ? What happens when you go to the settings menu select Wireless Setup and then you scan for a network, are you able to detect any of the WiFi networks that are in range? Still one of the best TVs in class - great picture quality, perfect size for TV and cinema, great product for the price.